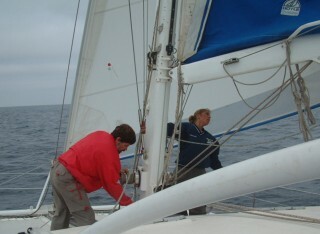 Average Wind and Sea Conditions: About 12 knots, from the SE. Swells to 6 feet. You can also read the newsletters we sent by email from the boat while we were on this passage. They have a certain immediacy and reflect our up to the moment thoughts and feelings. 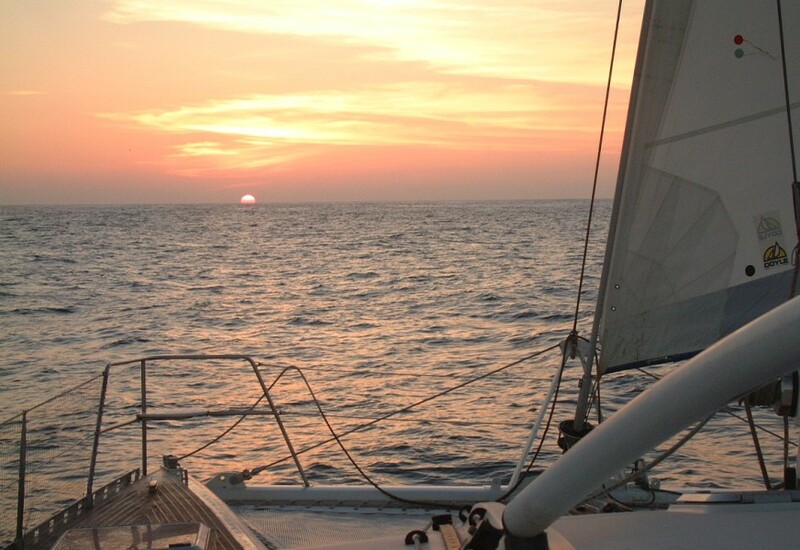 (Jon) The observant will notice that we did not follow a straight path in sailing from Manta to the Galapagos. This was not by accident. It's because of the prevailing winds, which come up from the south and then fan out when they reach Ecuador, spreading NE towards Columbia and NW towards the Galapagos. So the straight line course would have meant beating (an uncomfortable point of sail) out of Manta and then almost a dead run (a relatively slow point of sail) into the Galapagos. By heading a bit NW at first, we started out on a close reach (much more comfortable than a beat), which soon turned into a beam reach as the wind backed around. As we got further west, we could head more directly for the Galapagos and still keep the wind just aft of the beam, a comfortable and relatively fast point of sail. An interesting aspect of this passage, all of which was within 60 miles of the equator, was how cold it was. Long pants and windbreakers, usually kept on board only for trips to the mountains, were necessary if we went on deck after the sun went down. The cold Humboldt Current comes from Antarctica, up the coast of Chile and then spreads west into the Pacific just south of the equator. We noticed that water temperatures, usually about 80° F (27° C) in the Caribbean, dropped down to 70° F (21° C) by the middle of our passage. This Humboldt Current is also responsible for cyclones in the South Pacific. A strong current spreads cooler water far to the west, preventing the high temperatures cyclones need to start. If the Humboldt Current fails or is weak for some reason (an "El Niño year") then the Pacific warms up much faster and the cyclones can form more often and much further east. Birthday Breakfast - homemade cinnamon rolls! (Amanda age 14) Quite a nice passage, actually. It was nice and quiet, no hectic 23.5 knots boat speed or anything. There were several ships out with us the first night or two, but then I got watches when I saw absolutely nothing around us but dark water, a black sky with twinkling stars, a bright moon, and swallow-tailed gulls. Also, I turned 14 over the passage. Probably not the way I would choose to spend my birthday, but surely exotic. Years from now I could look back and think, "What was I doing on my fourteenth birthday? 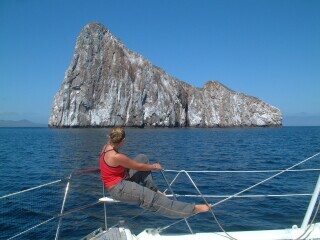 Oh, yes, I was sailing to the Galapagos!" Not everyone can claim that. It was a nice birthday, with cinnamon rolls for breakfast, rotis for lunch, and I didn't have to do any of the cooking or washing up. I did have to stand night watches, but I find I don't mind those as much. It was amazing, sometime in the morning we sailed through a jellyfish soup. I was asleep, but Mom was bringing up a bucket of water for washing dishes, and it was filled with jellyfish! She looked in the water, and there were probably twenty for every cubic foot! (Sue) This was more like the South Pacific Passages we'd been hearing about for years. Full moon, wind well aft of the beam, a long gentle swell, and a pretty non-occasion passage. For me the thrill was having Waved Albatrosses circling our boat when we were 200 miles from land, and then, a real surprise: to have Swallow-tailed Gulls flashing their white bellies around us at night. These gulls, which breed only on the Galapagos Islands, are the world's only nocturnal gulls. They are reported as far as 30 miles east of the islands, but we saw them night after night, starting about 250 miles east of Galapagos. 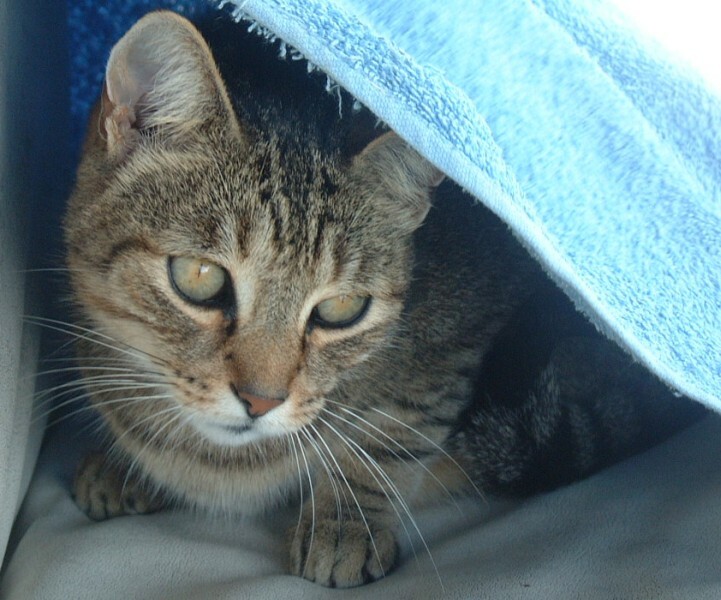 The animal life on board was equally interesting: Arthur, our 7-year-old gray tabby, passed almost all 100 hours on the helm seat, demanding that food and water be brought up to him. We had to lift him down to his litter box, but he was happy to jump back up to the seat. When the seas lay pretty flat, he actually jumped down on his own and walked out to look at the night ocean from the starboard deck. He got his exercise by attacking the end of the jib sheet that I would dangle in front of him and tease him with. He only slid off the helm seat once when he retreated from the rope game too fast into his "tent" made by a towel on the seat, and crashed to the deck! 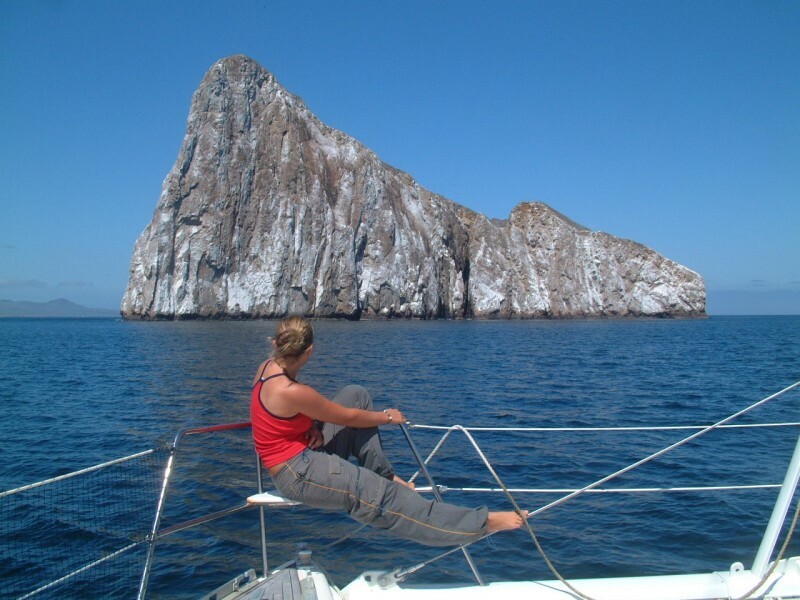 (Chris age 16) Well, I can't say I enjoyed it, but the passage from Manta to San Cristóbal, Galapagos was the best of our three multi-day passages so far. 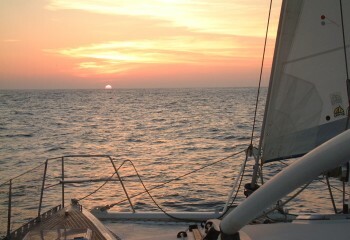 The seas were fairly calm, our speed was reasonable, the autopilot did almost all the hard work, and I got enough sleep. It was actually fun, in a way, to have Amanda's birthday while on passage... nobody had any other duties except the watchperson, and they didn't need to do much. I even managed to do some schoolwork by the end of the trip. Besides, getting to the Galapagos was worth it, even if I do think an airplane is a far more practical vehicle for overseas travel. Of course, our next passage is going to take about a month. We'll see how that goes. Wind Speed and Direction are Apparent, not True. That is, they are how our instruments perceive them while we are moving.